10th Annual Forum for the EU Strategy for the Baltic Sea Region: Open calls for seminar are now open ! 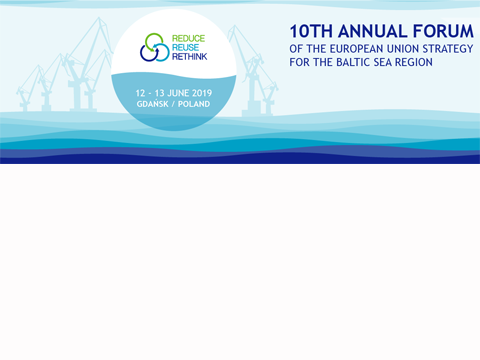 The 10th Annual forum of the EU strategy for the Baltic Sea Region will take place the 12 & 13 June 2019, in Gdansk (Poland). Under the thematic "Circular and sharing economy as an answer to demographic changes and environmental challenges in the Baltic Sea Region", 18 slots for 90-minute seminars will be discussing essential topics among all interested stakeholders! Have your say! Fill the form for participation and submit your proposals to the Organiser via e-mail: 10thAnnualForum@pomorskie.eu by 15th February 2019. Looking forward to welcoming you in Gdansk !